Written By: Paul Teutul Jr.
Narrated By: MacLeod Andrews, Paul Teutul Jr. 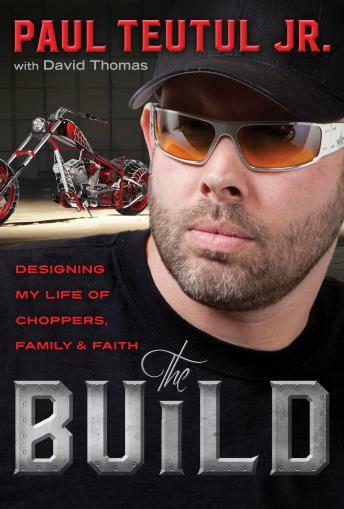 Author Paul Teutul, Jr., is arguably the most creative builder of custom 'chopper' motorcycles in the world. His talents were revealed to millions of TV viewers worldwide on American Chopper, as well as later in a spinoff series, American Chopper Senior vs Junior. The Build gives the listener a glimpse at Paul Jr.'s life behind the camera, which included volcanic conflict with his father and business mentor, Paul Sr. Using his own story of improbable success as an illustration, Paul Jr. offers insights on how anyone can find and activate often hidden talents. In a charming, often humorous way, The Build is a rallying cry to unleash your creativity and live life to the fullest.